Community's Journal and Standard of Truth, The. This Volume is Devoted to History, Science, Art, and General and Domestic Intelligence; with Foreign News, Etc. Also, Shewing the Moral, Spiritual, Religious, Psychical, Social, and Political Conditions of the Human Race, with Authenticated Domestic Tales, and Other Useful Information, Select Varieties, Poems, Notices to Correspondents, Etc., Etc. / A Periodical Devoted to the Political, Moral, Spiritual, Religious, and Physical Conditions of men, Containing . . .
Nottingham, England. Publisher: Holyoake & Co.. Editor: J.G.H. Brown. Corporate author: Spiritual Circle, Nottingham1/1, June 13, 1857-1/19, October 24, 1857. 8-16 pp., 1d. Bound volume 1 s. 6d. Frank Podmore, Modern Spiritualism (1902), 1:41-42, describes the doctrines of the strange visionary, crystal seer, medium, socialist, and healer J.G.H. Brown who published this journal. He had earlier published a series of tracts on "Important Revelations from the Spirit of Emmanuel Swedenborg and Joseph Smith," and the like, and touted the messages he received from the Duke of Wellington, Oliver Cromwell, and the Angels Michael and Gabriel. 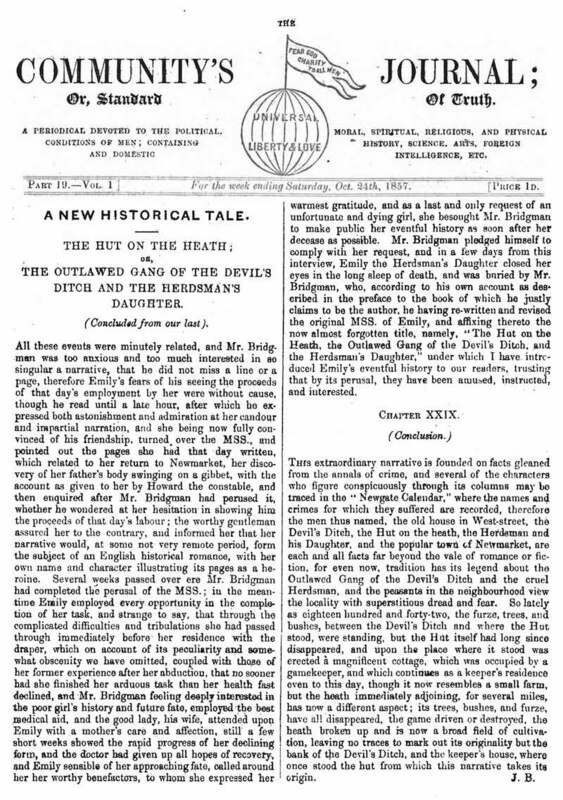 The first issue of this journal announced that "We, the Spiritual Circle established at Nottingham, having received instructions for the foundation of the Great Universal Organization, by enrolling Members who will pledge themselves to resist all worldly delusions, and to unite their energies solely for the welfare of their fellow-creatures, and the Glory of God." The welfare of man, in turn, seems to have included uplift of the downtrodden working classes, removal of tyranny, amendment of the marriage and rent laws, the income tax, and general preparation for the coming millennium. Brown's followers had earlier published The Scriptural Magazine: Or, the New Testament Revised by Divine Revelations, London, 1856-1857, based on his crystal revelations from the angel Gabriel. The journal, although prompted by the crystal revelations of Brown and his wife, welcomed correspondence and contributions from more orthodox spiritualists-Brown titled himself "medium"-and also Brown's ruminations on astrology. Like so many other journals, Community's Journal bulked out its offerings with serialized fiction of a reformatory tendency. The prefatory remarks to the bound volume of the first 19 issues (the only ones published) lamented the failure of the class for whom the journal was issued to embrace and support it, and listed the financial sacrifices (£ 5 per issue) that had gone into producing it. The final issue announced the appearance in November of The Universal Magazine; or, Truthful Recorder of Passing Events.